In my latest post, I gave you the definition of “fit for duty” and talked about the trend toward mandatory reporting of unfit nurses. Today I’ll talk about the signs and symptoms of impairment, recommended ways to intervene and report, and some recent legal cases that tie in directly to this topic. Which of the following nurses may not be fit for duty? Mark is back at work after several months following an accident. A pickup truck forced his motorcycle off the road and down an embankment. He had several fractures and is still in physical therapy for back problems. He’s quiet and not nearly as talkative as he was before the accident. Several times this week you’ve noticed an unsteady gait and slurred speech. He’s forgotten several important orders on three of his patients that you, fortunately, caught. He says he’s just trying to get back into his normal working flow. Susan has been with the hospital since she graduated from nursing school over 40 years ago. She was the director of the unit until four months ago when she agreed to hand the reins over to someone else. She says she wanted to get back to floor nursing, but she’s not adjusting–even when she’s assigned fewer patients. She is forgetful, has made several charting errors, and when someone offers to help her, she gets defensive and makes excuses. The other day, as you were walking to the parking lot after work, you found her standing at the end of an aisle in tears because she couldn’t find her car. She didn’t seem to recognize you for a minute. Caroline just called in sick for tonight’s shift. In the background, you could hear a banging noise like someone steadily knocking on a door and you also heard Caroline’s 4-month old son howling. This is the third time in as many weeks that Caroline has called in. When she is on duty, she’s distracted by personal phone calls and texts, yet she’s also told you she needs the money and wants to work some extra shifts. David, the charge nurse, says he found her last night leaning into a corner at the end of the hall, asleep. The baby apparently has colic and Caroline’s sister-in-law had to move in with them a month ago when the state residential facility for disabled adults where she’d lived the last ten years lost over half of its funding due to budget cuts and had to discharge most of its residents. If you answered “all of them,” you are correct. Each of these nurses needs to be evaluated for fitness for duty. Remember that it isn’t just an alcohol or drug use problem that may make a nurse unfit for duty, although those get more attention and publicity. 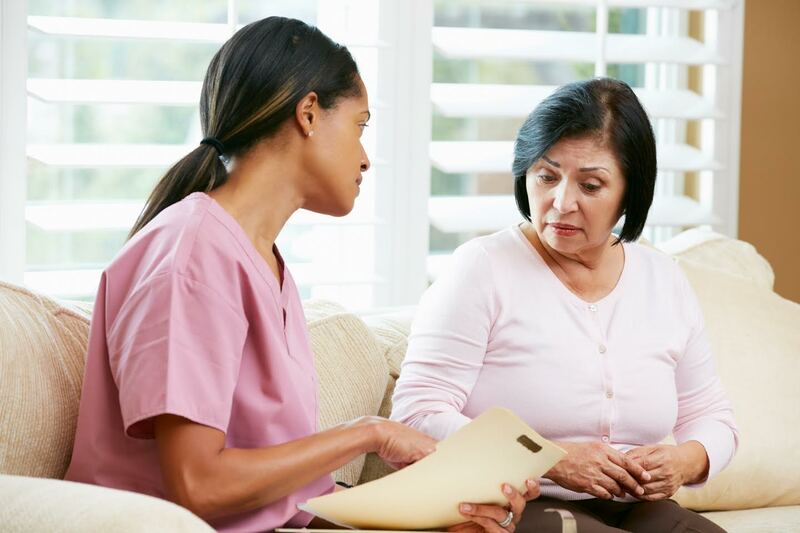 Physical conditions such as a chronic illness, chronic pain, a lack of sleep over time, the onset of dementia, musculoskeletal, cardiovascular, respiratory, and neurological problems can affect a nurse’s ability to care for patients. In addition to mood or mind-altering substances and physical problems, psychosocial issues, cognitive disorders, and distorted thought processes can impact professional judgment and critical thinking skills. Stress, domestic violence, divorce, family issues, and financial problems can take a toll on even the most resilient of us. As with every difficulty, the first step is to recognize there is a problem. Nurses need to know their limits and ask for help, whether from the employer or another source. Leaders and colleagues must monitor themselves and co-workers, and everyone must learn the signs of potential problems. Like most people, nurses notice changes in behavior or physical signs of a problem but minimize or dismiss them. We know these people and assume there must be a simple explanation; but, if as experts caution, work is one of the last places where problems impact performance, then every observation is important and failure to act can lead to serious – even deadly – consequences. Understandably, professionals worry about speaking up because doing so can impact a colleague’s license or backfire on the observer. But under our professional code of ethics, we have obligations to our patients, the public, ourselves and our colleagues, and to our profession. Saying nothing, doing nothing, is neither ethical or professional. Some mistakenly see problems as a sign of weakness, a moral failing, or stupidity and do not understand that substance abuse problems are none of those; they are progressive chronic diseases. Other problems can mimic or be mistaken for alcohol or drug use. But whatever the cause, life can be overwhelming sometimes. It is easy to critique from the outside but hard to know what you would do in identical situations. Behaviors are the first signs that most of us think of when asked to describe someone with a possible impairment. Common ones include distancing from colleagues, lying, becoming defensive, mood swings, personality changes, unusual or inappropriate responses to questions or comments, confusion, forgetfulness, trouble concentrating or easy distractibility, secretiveness, making more frequent or more serious errors, blaming others for mistakes, and inconsistent work performance. Physical signs can include changes in appearance or hygiene, sleepiness or hyperactivity, vision or eye problems such as dilated or constricted pupils, glassy or bloodshot eyes, trouble focusing, sweating, tremors, unsteady gait, slurring of words, frequent runny nose, recurring nausea, vomiting or diarrhea, and exaggerated emotional responses or behavior. Anyone may have one or more of these signs on occasion and it doesn’t mean we have a significant problem. The key is to compare new or recent on-set behaviors with past patterns. Has something changed from normal patterns? Is the person going through a major personal problem – has anyone even asked? Has the individual shown multiple signs on two or more occasions? Have others also noted the signs or changes? Consider the signs in context. Has the unit gone through significant changes recently, been unusually stressful or busy, or are surveyors coming or leaving? Are several colleagues showing signs of distress? Also consider the impact of the signs and behavior seen. Has the nurse made more errors or more serious errors? Is the nurse’s practice substandard on more than one occasion? Is the conduct a threat to patient or colleague safety? Have others had to pick up the slack or cover for the individual? Does the conduct reflect badly on the nursing profession or could it if it continues? It is also important to think about your index of suspicion. Are you uneasy, moderately concerned or seriously worried? How do you know what you know? Do you have first-hand knowledge, direct observations, test results or a diagnosis, or other hard proof such as written documentation? Or is it more of a collection of vague suspicions sensed by one or more colleagues? Would a reasonably objective outsider be concerned? Or do you need more information? For any question of impairment or unfit or unprofessional practice, documentation is essential. Each observation or situation should be objectively written up. Those with first-hand knowledge are the best sources. Note names, dates, times, and the circumstances. Keep the file securely locked and limit who has access or knowledge to those with a need to know. Once you’ve decided that there is a problem, decide what your next step should be. Review your state or territory reporting policy. Look at your organization’s policies and find out what resources are available to help the individual. Remember that even if the evidence points towards alcohol or substance abuse, there are almost always other problems or triggering events that should be uncovered and addressed. Put yourself in your colleague’s place – how would you want to be treated if you had a problem? How would you feel? This person is down. Will kicking help? Firmness and clear limits are important but so is a measure of understanding and compassion. Review what you know and what you don’t know. Do you need more information, either from the person themselves, or from an expert? Choose a quiet, private, neutral place in which to talk to the person. Be sure to have someone who can act as a support person for the individual. Having someone from Human Resources present is usually a good idea. One person should do most of the talking while a witness watches and listens to all parties present. Be prepared – both on what will be discussed and how it is presented, and for strong reactions from the person themselves. Be clear about what is and is not acceptable action. The leader of the meeting must be someone who can control his or her reactions, stay calm, firm, and objective while focusing on the pre-determined goal which should be to inform the individual of their behavior, its impact on the unit, patients, colleagues and others, and to find a solution. The nurse in question must know what options are available and the consequences for failing to respond. Give him or her an opportunity to ask questions. Do not disclose names of witnesses and do not get pulled into a “blame game.” The behavior is the problem and the nurse must deal with it. Have a written statement of key points – behavior observed, that the behavior has impacted colleagues, patients, etc. (not how, just that it has), that the nurse must undergo evaluation before continuing duty or returning to duty, the timeline for the evaluation, what support the organization will provide, and the consequences if the nurse does not comply. If the nurse refuses to sign acknowledging receipt, at least provide him or her with a copy. Note on the organization’s copy the date and time of the meeting, and that the nurse refused to sign. Document the facts of the meeting immediately afterward in objective terms. Monitor the nurse, follow up at reasonable intervals and document everything. Report to the state or territory licensing board as required. There are many excellent resources available on the internet and in print. Start first with your own Board of Nursing and organization policies and regulations. The National Council of State Boards of Nursing has a brochure for nurse leaders on their website as well as several articles. “Fitness for Duty Includes Getting Your ZZZZs” is an excellent article by Debora Simmons and Cindy Zolnierek, published originally by the Texas Nursing Association and subsequently by the North Carolina Board of Nursing. The Florida Board of Nursing has recently published online a comprehensive continuing education piece entitled, “Recognizing Impairment in the Workplace for Florida Nurses.” No matter what state or territory you live in, this will give you a wealth of practical information to help identify potentially impaired nurses. Washington Health Professional Services has “A Guide for Assisting Colleagues Who Demonstrate Impairment in the Workplace,” available on the Washington State Department of Health website. It gives more detailed information on the crucial meeting with a possibly impaired colleague. Being fit for duty runs the gamut from sleep disorders to substance abuse. The essential duty for every nurse is to be aware of our colleagues, recognize subtle changes in behavior, ask about problems, offer help and support, and don’t ignore a possible problem until it erupts into an unavoidable situation or a dangerous error. We each have duties, not only to our patients, but to ourselves, each other and our profession.